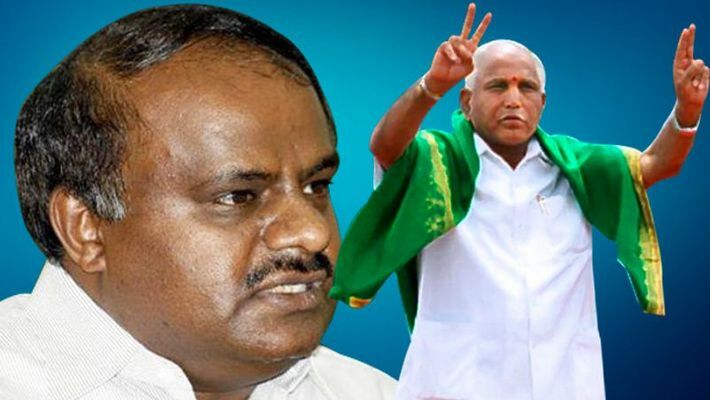 If the sources are to be believed, then on January 19, 19 legislators supporting the HD Kumaraswamy headed coalition will resign as per the direction from BJP National President Amit Shah. This move is made keeping the May 2019 Lok Sabha election. The images of Congress MLA Sharada Mohan Shetty from Kumta along with the BJP, two independent MLAs R Shankar from Ranebennur and H Nagesh from Mulbagal expressing their support to the BJP is an indication that Operation Lotus is back in full swing. However, BJP leaders deny poaching of MLAs from the Congress and the JD(S). Ashwathnarayana, BJP spokesperson says, that the BJP high command has clearly instructed that the Karnataka BJP should not lay its hands on the coalition headed by HD Kumaraswamy. "We will not welcome any leader who comes with a demand, nor have we resorted to any horse trading. The disgruntled MLAs are unhappy with the government as there is no progress, and as ministers like HD Revanna and the Congress leaders always fight," said Ashwathnarayana. He added that the JD(S) has bypassed the co-ordination committee chairman and Congress leader Siddaramaiah many times. The BJP spokesperson said, announcing that Prajwal Revanna would be a Lok Sabha election candidate without consulting the co-ordination committee is the last nail the coffin as followers of Siddaramaiah have decided to turn rebel. "As the government is in danger, JD(S)-Congress may try to poach BJP leaders and hence we have moved them to a resort in Haryana," said Ashwathnarayana. Leaders like CP Yogeshwar, CN Ashwath Narayan, CT Ravi, Jagadish Shettar, Umesh Katti are guarding the BJP MLAs. Kengal Renu, Karnataka Congress spokesperson says that the Congress is aware of the BJP's motive and has already reached out to the disgruntled legislators to appease them. "The BJP is very serious about 'Operation Kamala' and they are trying to destabilise the government. It shows that they are hungry for power," said Renu. However, the JD(S) says that the government is safe and there is no need to worry. "Those who resigned are two independent MLAs and the party whip and anti-defection laws will not apply to them. At this movement, no leaders are ready to face election. BJP resorted to poaching last time and they failed. Earlier they said that the government will collapse after Deepavali. The same was predicted to occur on New Year’s Day and now they have come to Sankranti. Next, they will predict that this will happen during Shivaratri and go on," said Sharavana, MLC, JD(S). According to sources, six legislators have camped in Mumbai and many are not in touch with the Congress leaders.